A few days ago Lervig kegged the new batch of Henrik Imperial Amber Ale. The rebrew of the hop monster is paler in color as a result of being brewed in the bigger brew house at Lervig. This resulted in less caramelization of the wort. This being said, fans of the first version will absolutely recognize the brew. To call this brew balanced might be a stretch considering the amount of alcohol and the massive hop profile. But – I really think it is just that – balanced. It seems to be even smoother this time around, but don’t take our word for it. The brew is getting ready to be shipped to Henrik Øl & Vinstue in Bergen as we speak and there is talk of some kegs getting shipped somewhere else. We can hardly wait to get to know the rebrew of this massive beer and share it with you guys. We absolutly feel it has been worth the wait and are wondering how long it lasts before it sells out this time. We’ll get back to you with a release date and release venues later. Our last pilot batch left our trademark American hops behind and focused on a roasty yet smooth malt profile. 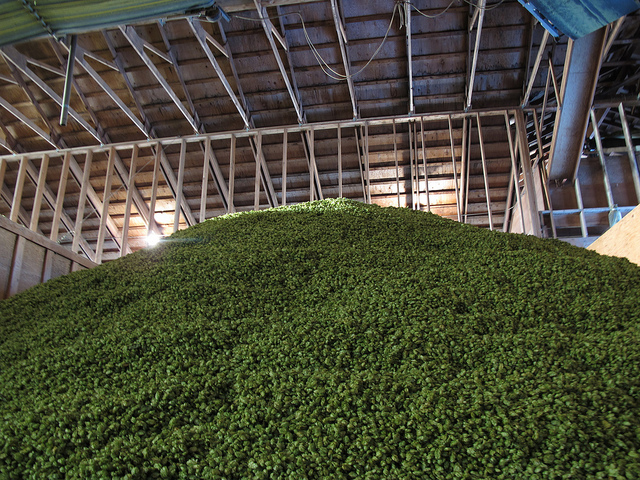 While we are OK with this it pleases us to announce that the hops are back – with a vengeance. Our latest brew is a hop forward West Coast IPA brimfull of both Chinook and Centennial. Hop lovers rejoice. In this brew we’re marrying a balanced malt base with a whopping 1/4kg of hops in 22,5 liters of beer. We’re pushing hop bursting to the limit by adding 55IBUs of the total 65 during the last 15 minutes of the boil. 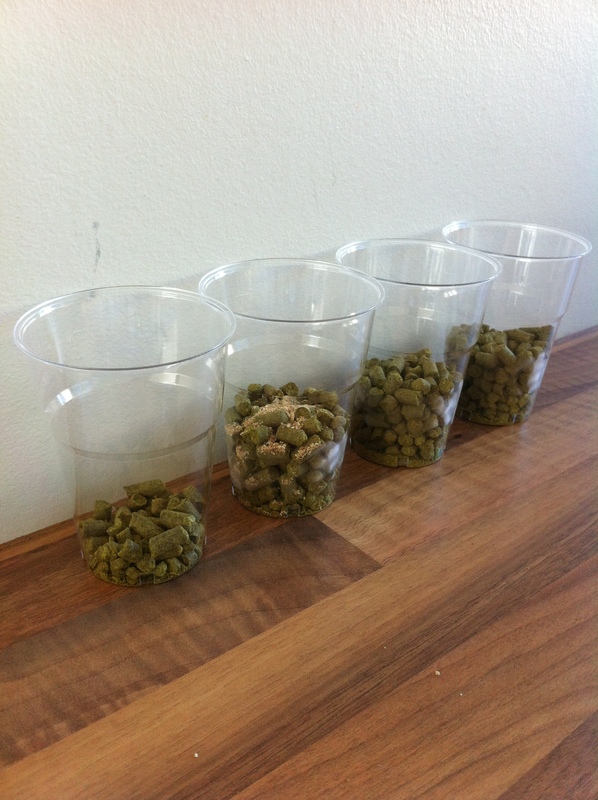 And staying in the Andrimne/Black Cat mindset – no hop monster is complete without massive dry hopping. The IPA will be double dry hopped with a mix of Chinook and Centennial. The brew, codenamed “Colic IPA”, is primarily brewed for a new pub in a new town. 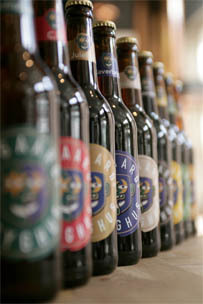 We promised earlier that we’re hard at work spreading our brews to more pubs and places. Well – we intend to keep our word. Care to venture a guess on where it ends up? More on this beer and where it ends up later. The green gold – for once in conservative amounts! 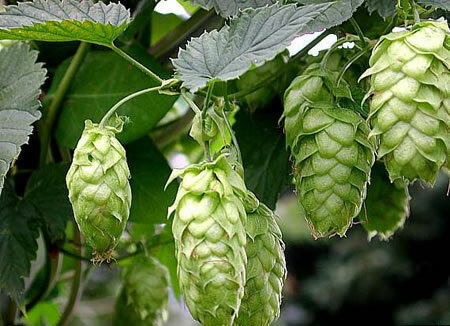 Craft brewers love hops, home brewers love hops, beer geeks love hops. We sure love hops as well, but sometimes the time is just right for something else. Sometimes the time is just right for a low alcohol dry stout. And that’s why we’re brewing a dry oatmeal stout at Kinn Bryggeri for Henrik Øl og Vinstoves 20th anniversary on the 10th of January next year. But as with all our brews, we do test batches first. This one was brewed a few days ago. With an original gravity of 1.040 and 40 IBUs from a single FWH addition of East Kent Goldings (and an undisclosed amount of Chinook! ), the beer isn’t likely to blow the socks off of anyone, but the simple yet effective malt bill provides sustenance and a subtle complexity of roast flavors sure to please. Roasted barley is of course the signature malt, while amber malt adds mild coffee and nutty flavors and aromas complementing the burnt character of the beer. 10 % Flaked oats and a smaller amount of flaked barley round off the edges and provide a mouthfeel that belies the strength of the beer. Hopefully it will emerge black as the ace of spades, sharp yet rounded, dry and refreshing. We can hardly wait to get to Kinn to brew this beer together with Espen, Torvald and the other guys at the brewery. Our wishes for New Year’s are modest; we simply want the 10th of January to come quickly! I have said it before and I’m saying it again – brewers are by far the best people out there. We told you earlier that Espen Lothe helped us out with the Simcoe hops but the story doesn’t end there. For the Amarillo we contacted Mike Murphy at Lervig Aktiebryggeri. Unfortunately he was all out of them, partly because we just used 10 kilos for the dry hopping of Henrik Imperial Amber Ale. However, he put us in contact with Anders Kissmeyer from Kissmeyer Beers and previously Nørrebro Bryghus. Anders had the hops we were craving, but he was unable to send them to us as he was traveling in Canada. He got in contact with Nørrebro Bryghus, where he stores his hops, and got the brewers there to send them to Søgaards Bryghus. To sum it up – Kinn Bryggeri, Lervig Aktiebryggeri, Kissmeyer Beers and Nørrbro Bryghus all helped us make our lager a reality. Brewers really are something else! Thanks, guys, we owe you big time! Andrimne/Black Cat Brewing is proud to announce that we’re heading abroad to brew no less than two beers at Søgaards Bryghus in Ålborg, Denmark this November. We’re brewing Supermax Lager and an India Brown Ale. Again we’re going hop heavy with our beers. A big thumbs up to Espen Lothe at Kinn Bryggeri who provided the much needed Simcoe for the lager. A hard hop to come by these days. Thanks, Espen! We’re very excited to get to play with yet another brew house. The brew house is a copper clad beauty reminiscent of the likes of Anchor brewing. Brewing on a system like this and brewing our beers abroad are literally dreams come true. First we take Aalborg then we take… And so on! Look for these beers sometime before Christmas!